It is what is beyond the words that hears this message, beyond what you may want to figure out or leave behind. Seeking Nothing is very pleased to welcome Naho Owada to a one day event in London on 8th September. Naho is heading back to Japan in October and is coming over from France to speak at the Horse and Stables pub in Waterloo (see venue details below). 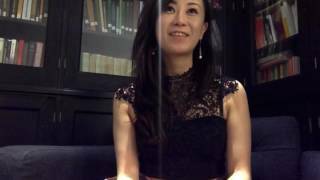 Naho has spoken in London previously and is due to publish her book in English imminently. Naho’s message resonates with the Empty Fullness communication which “Seeking Nothing” participants will recognise. We look forward to seeing you there. The talk will be 10.30 to 16.30 with refreshments and will cost £35. Email neilsanis@outlook.com to book a place. Everyone is welcome to join us for a drink after the event. It was before the age of one when Naho sensed that humanity, this world, was not a comfortable place. Her mother told her that she first noticed Naho’s experience of the world while she was in her baby seat. Naho appeared to be in shock. She said that often her eyes would be wide and moving from left to right, as if she were seeing evil or in terror. Naho was very tense. Somewhere around the age of three, there was a natural sense that saw clearly the loneliness or suffering underneath all humans. Naho could see in the faces that there was something hiding, an unease underneath the smile. Naho was always feeling uncomfortable. By the time Naho turned five, she asked her mother why she had to continue to live. It was in her teen years that Naho began her deep search in finding the cause of the uncomfortableness, of which she never found. Around the age of 20, Naho realized she would not find the answer where she was looking. She didn’t experience any tragedies in her life and therefore knew that it was not the story of the life that was causing her suffering. At the age of 25, she met a man who had had an experience of this. He told her that the cause of suffering was the phantom self. She began to see that wherever she went, there she would be. It seemed to be following her; this ‘I’. She couldn’t escape the self that seemed to be having such uncomfortableness. It was from there that she knew she found the answer she was searching for. It became evident that everyone is born with a sense of lack that comes from apparent separation–but this has nothing ​to do with the story of their apparent life. People try to find the answer in their storyline and that is because they think if they change the story, it will bring them happiness. That isn’t true. That will only bring relief for a short period of time. It began to be obvious that the person we believe our ‘self’ to be, is a complete illusion. Soon thereafter, there came an apparent moment (while on her way to the organic supermarket) that the illusion completely vanished. What was left is everything, without a center. ​Many people have been asking about Naho’s whereabouts. For the past two years, Naho has been very busy sharing her message in Japan. Most of Naho’s invitations have been with the world’s most renowned and important buddhist monks asking her to come and share her message in their temples which are the treasure of Japan. While in Japan, Naho wrote and published three books on her own, all of which are doing very well. This message being the closest to her heart is now going to be available in other countries, as Naho is residing in both France and Japan and is now travelling with her message all over the globe. Stay tuned to the most recent book that Naho has been working on, an English book that has taken her a full year. It will be available for purchase at her next talk which is the eighth of September 2018 with us. The Horse and Stables (www.thehorseandstables.co.uk), 122-124 Westminster Bridge, Rd, Lambeth, London SE1 7RW right by Lambeth North tube station on the London Underground. Based in the Waterloo area, ten minutes walk from the mainline station or one stop on the Bakerloo line, the talk is held in the pub’s function room, up a flight of stairs at the back. The venue is really informal, it enables us to keep our costs low and ensure speakers are paid more. The Horse and Stables also happens to be a hostel with cheap accomodation. Waterloo is the perfect location for visitors who want to stay in central London as well as those travelling from North or South London. There are some nice eateries and pubs before/after/during, including the Horse and Stables itself. There is a local supermarket opposite and refreshments are provided during the talk.